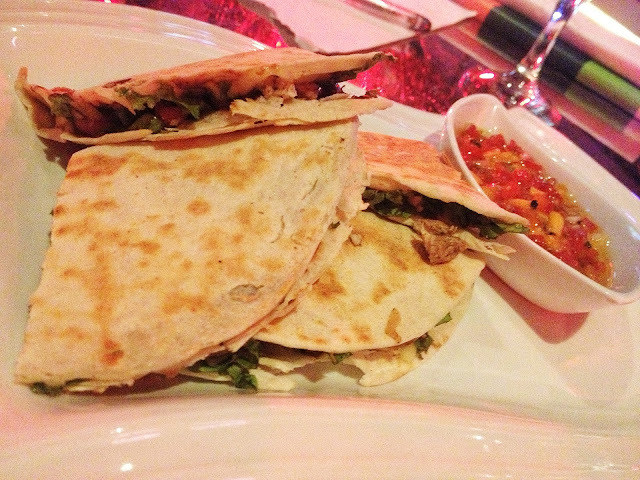 The quesidillas are good. Not too dry but definitely meaty. The mango salsa was so fresh, I liked the combination. This became an instant favorite. The blend of flavors are new to my taste buds. The Feta Salad became a favorite of mine. 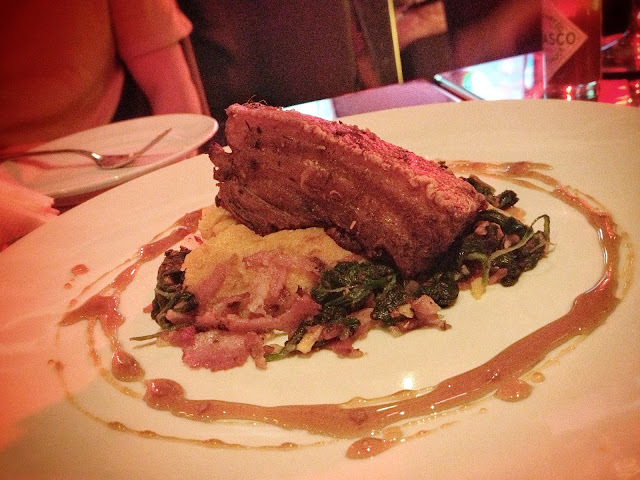 The roast pork belly was served with pumpkin potato mash and bacon sauteed spinach and honey bourbon gastrique as side dish instead of the typical rice. The side dish was a sure hit for me. At first I thought that it was a sweet potato mash, and was surprised that it was pumpkin infused mashed potato. 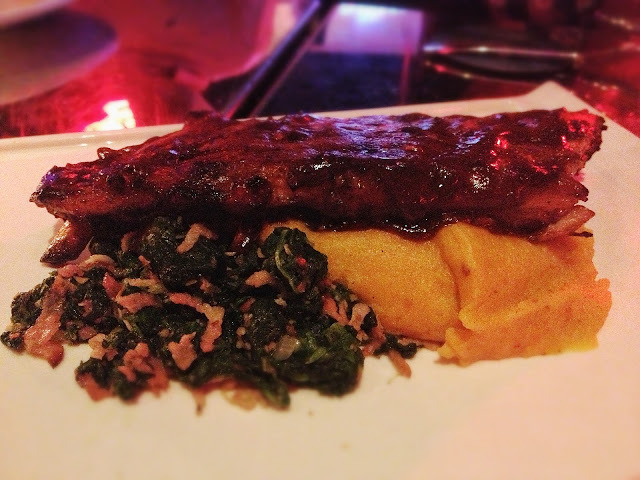 The sauteed spinach with bacon and gastrique complemented the mash giving enough savory flavors to both the pork belly and mash. The pork belly was okay but along with the side dish, the flavor tasted nice. It was my first time trying this dish and I didn't know what to expect with the Owosso Bucco. I haven't tasted the bone marrow, from which I was told should be the highlight of the dish. 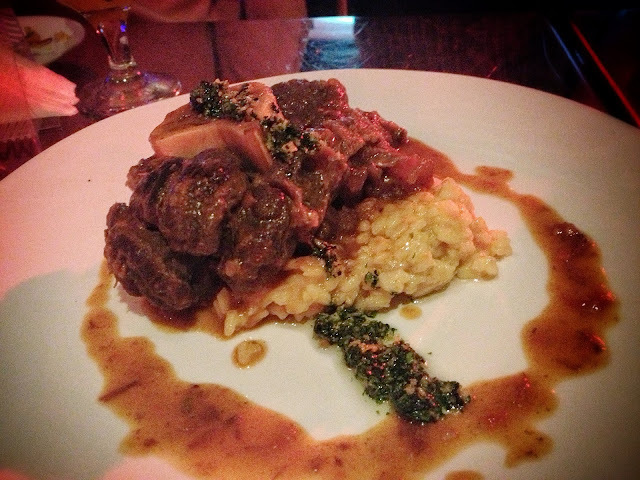 The meat is okay and the risotto was fine. This was served with the same pumpkin potato mash and bacon sauteed spinach and honey bourbon gastrique side dish. The ribs are okay, not your melt off the bone type but definitely filling. And the side, need I say more? FAVE! 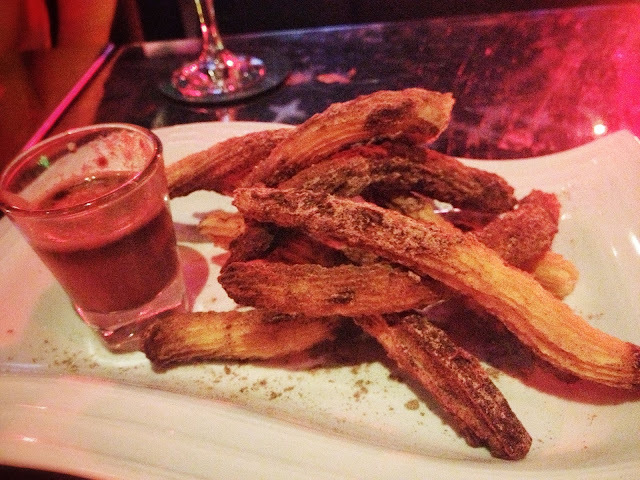 The churros was very tasty, crunchy in the outside, soft and yummy in the inside. The chocolate dip was not too chocolatey an not viscous. I'm not sure if the choco dip should be a bit fudgey or not. But it would taste better I think if the chocolate taste was prominent. I just had a bite of this because I was too full. 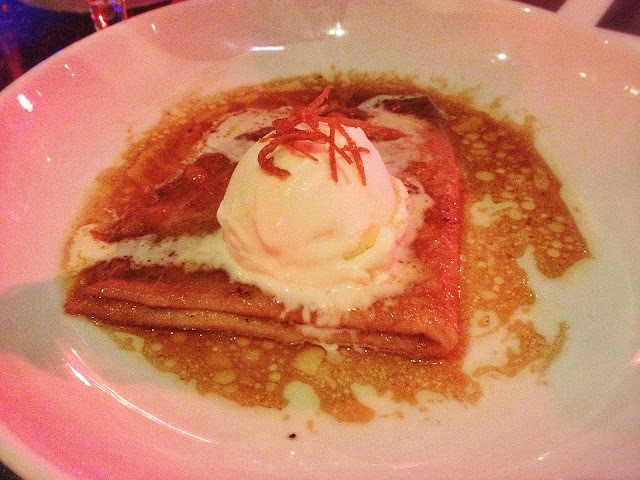 I like my dessert sweet and the crepe does it. This is a good option to cap off as a dessert. We were lucky because for that night, they have Marki Stroem to serenade the diners at the Apex Lounge. We can't stop gushing over how charming and how smooth Marki's jazz voice is. It was my first time seeing him perform. 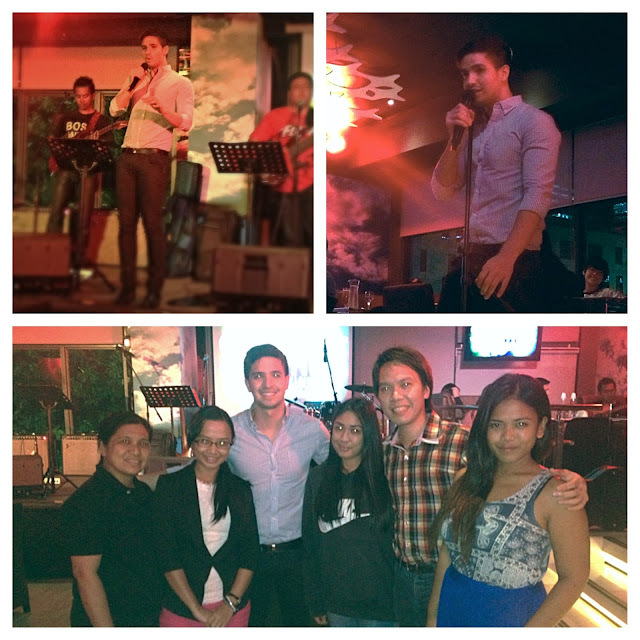 I was awed on how fluent his Tagalog was, specially singing Ronnie Liang's Ngiti. Thank you Aldous for the invite! 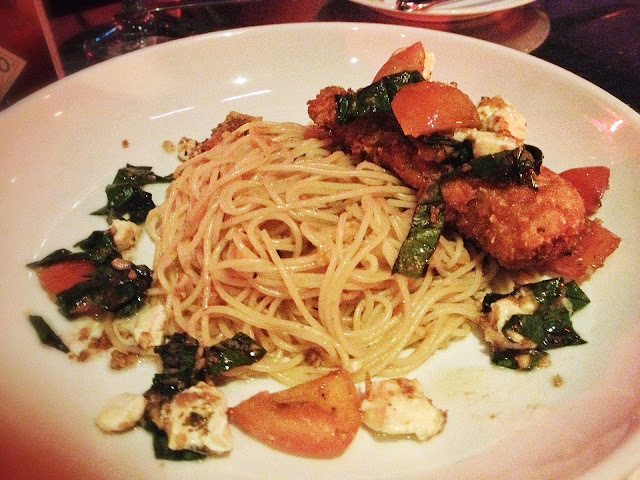 I'd definitely go back to dine at the Apex Lounge. I am always intrigued by the fact that almost everyone says that anything with truffle oil tastes amazing. So I wanted to try their Wild Mushroom Pasta and Mushroom Truffle Pizza when I saw it on their menu. I love mushrooms, so I am intrigued on how this combination would taste. Adobo pizza is a best seller at the Apex Lounge, so I would want to know how good this is. 7th High is one of Manila's premiere boutique nightspot situated at the very posh Bonifacio HighStreet. 7th High has three areas: The APEX Lounge, which is used for live performances and dining reservations; The Club, the main club that can fit 500+ people which hosted several concert after parties featuring international artists such as Bruno Mars, Apl de Ap (Black Eyed Peas) and Mike Posner; and The Club Room, which is more like a VIP lounge with VIP suites and concierge service and can also be used for private functions.